Dining in the Point Reyes National Seashore and Coastal West Marin offers a wealth of possibilities. Breakfast, lunch or dinner … Pt. Reyes and Coastal West Marin restaurants offer an outstanding range of delicious eating experience in every price range. From simple cafe fare to fine dining, from bakeries to oyster shops variety and uncompromising quality is the code of this coastal region. 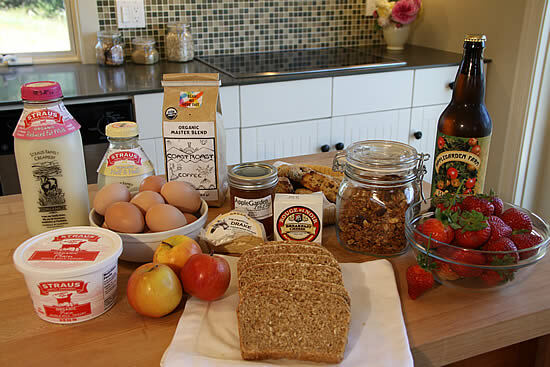 Local, organic produce is often the mainstay of a satisfying foods created by some of West Marin’s top chefs and bakers. The Point Reyes and Coastal Marin area is fast becoming “the place” to experience farm to fork dining. Farm-to-table (or farm-to-fork) refers to the stages of the production of food: harvesting, storage, processing, packaging, sales, and consumption. Farm-to-table also refers to a movement concerned with producing food locally and delivering that food to local consumers. Linked to the local food movement, the movement is promoted by some in the agriculture, food service, and restaurant communities. It may also be associated with organic farming initiatives, sustainable agriculture, and community-supported agriculture.